Yesterday, I wrote to you about Google Analytics and God’s wishes for us here on earth. In talking about assisted conversions, I probably betrayed my bias against social media. That probably came as no surprise to longtime list members. I tend to be negative about organization’s use of social media because I feel the need to compensate for their tendency to rely on social networks to communicate with their audiences — particularly Facebook. It’s easy to find yourself chasing likes and follows and shares, especially if you aren’t equipped to quickly pull up more meaningful metrics, like conversions in Google Analytics. Anyway, in yesterday’s email I said you’d probably find that Facebook and other social networks generate few revenue-generating conversions compared to other channels. I’ll bet that if you have goals set up in Google Analytics, you’d find that he’s right — a single email address is worth much more than all these little nods of approval on Facebook. Email consistently performs better in building awareness and encouraging people to take action. The report looks at social media “engagement” across 12 industries with nonprofit being the most relevant for most readers here. We define engagement as measurable interaction on social media posts, including likes, comments, favorites, retweets, shares, and reactions. Engagement rate is calculated based on all these interactions divided by total follower count. We purposely focus this study on engagement rate instead of “vanity metrics” like follower counts because we know savvy social marketers want to know how they’re doing in relation to their competitors. Now, this report looks at larger organizations with more than 25,000–1M fans on Facebook, so maybe you could question whether the findings are relevant to you. 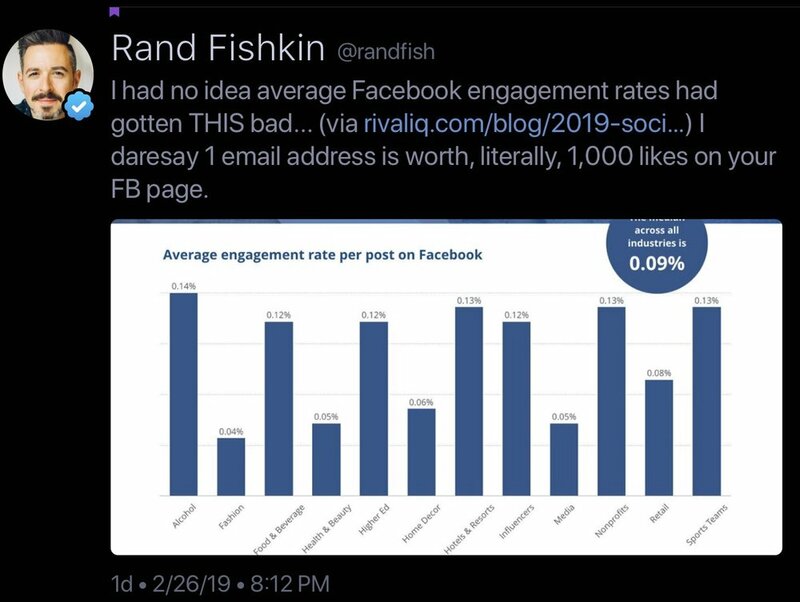 Another way to look at it, though, is that these metrics are what you could look forward if you were living the social media dream with a huge audience of followers. You’d be lucky to see 2% average engagement across these platforms. Yikes. Ok — now is the time when I feel the need to reel it back in a bit. I know that there’s some value in staying top of mind, and social media can help with that. But if you have Google Analytics configured with goals that report on revenue coming into your organization from these various channels, you can now zoom out and away from these kinds of engagement metrics. (Rival IQ is a social media analytics company, so they might not be motivated to recommend this.) Head over to your analytics account and see how much traffic from social is generating revenue for your organization — either directly or through assisted conversions, as I described yesterday. But based on the conversations I’ve had in recent weeks with so many museums folks, it seems unlikely that you have those goals set up in Google Analytics. In that case, you can’t access that information, which means — well, I’m not sure how you would draw a clear connection between these communication channels and website revenue. What’s prevented you from properly configuring your Google Analytics account and making use of goals to track audience behavior alongside revenue? Please hit reply and let me know.